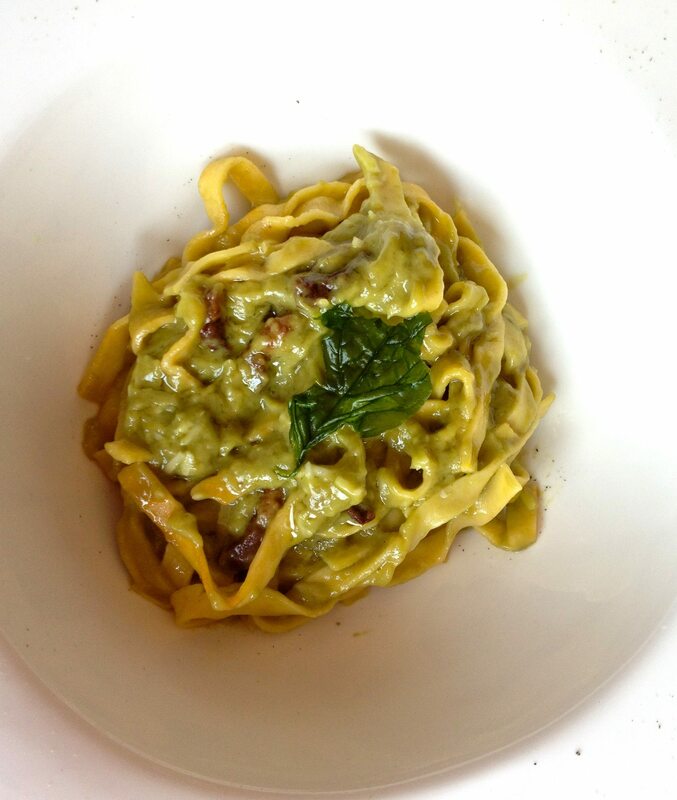 LUNCH PICK: Build a DiVino’s lunch — divine! Eric Diotte and chef Christian Lepore built a little sidewalk patio. The grand al fresco opening was Saturday. I stopped in for lunch on Friday, during the final flourish of construction mayhem, and got to witness the fun and the fretting while sipping an unoaked South Bay Chardonnay from Huff Estates. I was here for the Build a DiVino Lunch! special — any antipasto and any primo for $22. 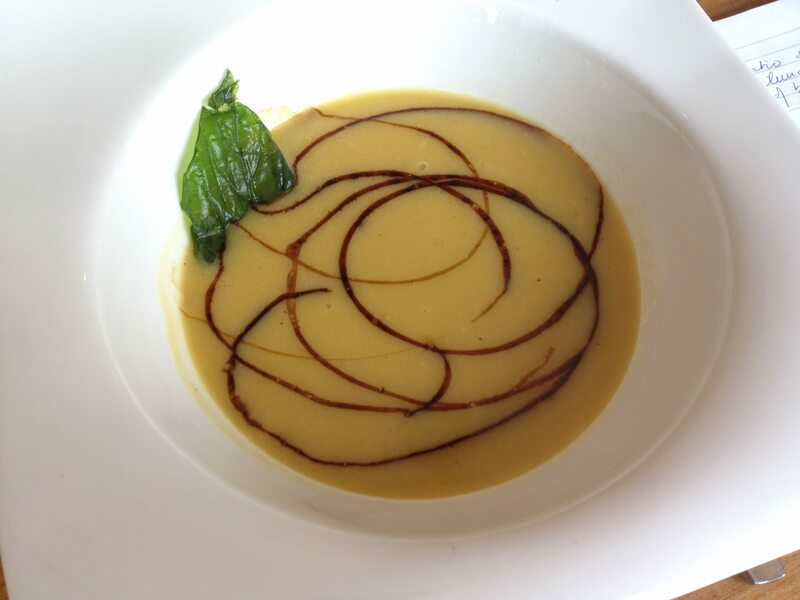 I chose the cauliflower and carrot soup to start, sweetened with loop-de-loops of a sticky sweet balsamic reduction, and with a flash fried basil leaf — which limped up instantly when plunged into the pool. It was a fine bowl with good vegetable flavour, thickened with potato — creamless/flourless. Which meant I could splurge on a wildly rich second course. This was a bowl of house-made fettuccine, perfectly cooked to al dente, swirled in a crisp bacon (lovely) and egg custard enriched with avocado, which turned the sauce khaki green and very creamy. It was a dish that startled at first — the avocado, such a strong presence — and then one that grew on me. And though I remain unconvinced of the pleasures of hot avocado, of this dish — matched with the Huff chardonnay — I am quite convinced. 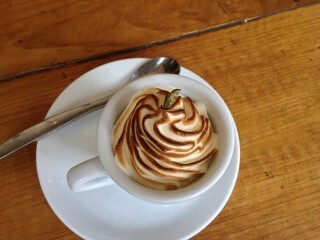 Dessert wasn’t part of the deal, but I was told it was straight out of the salamander — a cool maple custard in a wee mug, with a rosemary infused meringue foam. A leaf of rosemary had been candied to crown the bruléed top. Very sweet to look at; very sweet to eat. I trust the patio got finished and the launch party was a great success. Congratulations to Diotte and Lepore on their first anniversary.